With keynote speaker Qusai Zakarya! Qusai Zakarya is a 28 year old Syrian, of Palestinian decent, who has survived the August 2013 chemical weapons attack and over a year of life under siege in Moadamiya, Syria. With his 33 day hunger strike, he rallied world wide support to break the illegal siege of cities across Syria. He is touring North America to tell his story to the world. 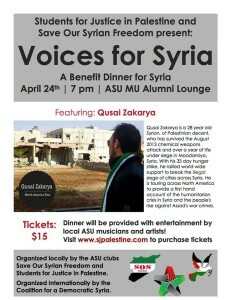 During his tour, Qusai Zakarya will describe a first hand account of surviving the August 2013 chemical weapons attack and the horrors of living under siege in Moadamiya, Syria, as the Assad regime implements its ‘kneel or starve’ policy in its attempt to suppress the popular uprising for freedom and democracy in Syria. 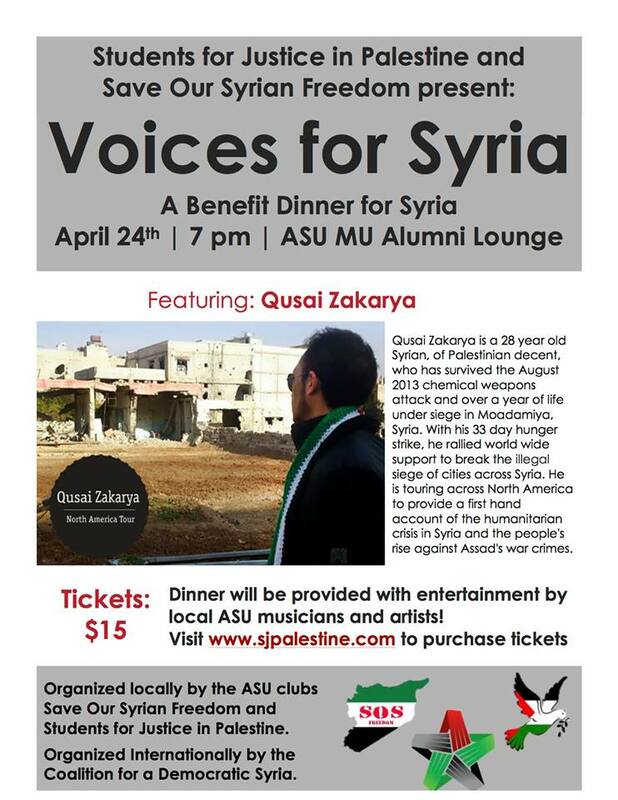 The night will also feature local ASU artists and performers who would like to share their talent to raise much needed proceeds for people inside Syria suffering from the conditions that Qusai managed to escape. All proceeds will go directly to providing humanitarian aid inside Syria. Check out the facebook event here for up-to-date announcements.